BAUGH, James - Company K - Very little is known about James. He was born about 1845 in Wilson County. 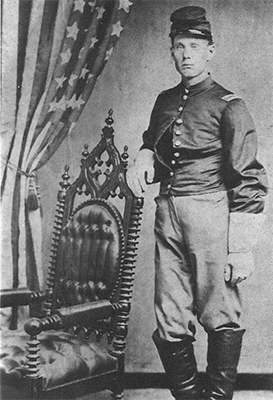 He enlisted on 16 July 1863 in Carthage and was described as 18 years old, 5' 8" tall, light hair, brown eyes, and a fair complexion. He was absent without leave on 14 September 1863 and later placed under arrest. The remaining time, he was present for service. It is unknown where he is buried. FARMER, David A. - Company K - David A. Farmer was born about 1845 in DeKalb County. He was the son of David H. and Mary Ann (Turner) Farmer. He enlisted on 25 June 1863 in Carthage and was described as 19 years old, 5' 9" tall, dark hair, blue eyes, and a fair complexion. He was charged with being absent without leave on 14 September 1863, but this charge was later removed on 21 May 1868. In November and December 1863, he was under arrest. By January 1864, he was back serving with his company. David never married nor had any children. His father died in April 1877; and the following year, his mother Mary Ann applied for and received a pension based on David's service. It is unknown where David is buried. Civil War Headstone records on Ancestry indicate that in 1884, the US Government supplied a military headstone which was erected in a family cemetery. Contemporary records do not show where the tombstone is located. FINLEY, James A. - Company I - James Americus Finley was born on 26 July 1843 in DeKalb County. He was the only child of Britton B. and Harriet Finley. Britton died when James was only 11 years old. Harriet then married James Howard. He died within a year of their marriage. James Finley enlisted on 26 January 1863 in Murfreesboro and was described as 21 years, 5' 10" tall, gray eyes, light hair and a fair complexion. On 24 February 1863, he was appointed 1st Sergeant but was reduced to 4th Sergeant 2 weeks later on 13 March. He was present for duty throughout his service. James died of gunshot wounds during the Battle of Dug Hill. James is buried in the New Hope Cemetery in DeKalb County (See FindAGrave). In 1866, his mother, Harriet Howard, applied for and received a pension based on James' service. Before entering the service, James worked for John J. Bowers, who was a Saddler in Alexandria. Bowers would often pay him in meal, flour and bacon, which James took to his mother. James also purchased mill and flour from Yandle Wood who owned a mill in Alexandria. According to Wood, while in the service, James would send part of his military pay home to his mother for food and support. FUSON, James H. - Company L - James H. Fuson was born about 1839 in DeKalb County. He was the son of Thomas and Aletha (McEntire) Fuson. He married Mary Jane Hendrickson on 5 October 1862 in DeKalb County. The couple never had any children. He enlisted on the 25 April 1863 in Carthage and was described as 24 years old, 6' tall, blue eyes, light hair and a fair complexion. He was present for duty throughout his service. On 22 February 1864, James was shot in the forehead and was killed instantly. It is unknown where he is buried. His widow, Mary Jane, applied for and received a pension in 1866. She later remarried. In 1892, James' father, Thomas, applied for a pension based on James' service, but he was denied benefits since James left a legal widow. GRANSTAFF, David - Company K - David Granstaff was born about 1837 in Smith County. He was the son of William Bumpas and Catherine (Rowland) Granstaff. He married Delilah Lawrence on 15 November 1856 in DeKalb County. They had three children: Massa W., Catherine, and Caroline. David enlisted on 13 May 1863 in Carthage and was described as 27 years old, 5' 10" tall, black eyes, dark hair and a dark complexion. He is buried in the New Hope Cemetery in DeKalb County (See FindAGrave). His widow Delilah applied for and received a widow's pension in 1866. HALE, James D. - Company K - James D. Hale was born about 1823 in DeKalb County. He married Mary Ann Adamson on 26 September 1847 in DeKalb County. They had five children: Joseph Thomas, Mary E., John F., Nancy E, and William J. James enlisted on 13 May 1863 in Carthage and was described as 40 years old, 6' tall, dark eyes, dark hair, and a dark complexion. He was a woodworker. About 22 December 1863, he was listed as absent without leave. He was present for duty the remaining time that he served. It is unknown where he is buried. His widow Mary Ann applied for and received widow's benefits from the Federal Government in 1869. She was a pensioner until her death on 5 May 1898 in DeKalb County. HARRIS, Shelton - Company I - Shelton Harris was born about 1845 in Patrick County, Virginia. He was the son of Shelton Harris and Rutha Harris. His parents never married. Shelton Senior left the country just after Shelton Junior was born. He never returned to visit his son nor did he ever support him in any manner. Shelton and his mother moved to Wilson County prior to 1850 and settle near John Christopher Cobb and Henry Hatley. When Shelton got old enough to work, he worked for Cobb who paid him $7/month. He worked for four summers, and each summer he turned his wages over to his mother. He enlisted on 29 November 1862 in Nashville and was described as 21 years old, 5' 8" tall, blue eyes, brown hair, and a fair complexion. During his time in the service, he deserted from the battlefield at Stone's River on 31 December 1862 with his horse, equipment and arms. During November and December 1863, he was under arrest. At the Battle of Dug Hill, he was shot through the right side and died instantly. He never married nor had any children. It is unknown where Shelton is buried. In 1865, his mother, who had never married, applied for and received a pension. HOLDER, Berryman - Company I - Berryman Holder was born about 1825 in Surry County, North Carolina. He was the son of Berryman and Deborah (York) Holder. He married Sarah Caroline Smith about 1847 in Warren County. They had seven children: Samuel S., Hugh B., Sarah Jane, Louis Jackson, Evaline, Mary and Rosanna. Berryman enlisted on 10 December 1862 in Nashville and was described as 37 years old, 5' 9" tall, hazel eyes, light hair and a fair complexion. He was present for duty throughout his service. He was promoted to Corporal on 31 July 1863. It is unknown where he is buried. His widow, Caroline applied for and received a Widow's Pension in 1866. JONES, Jonathan C. - Company K - Jonathan C. Jones was born about 1844 in DeKalb County. He was the son of Allen and Nancy (Griffith) Jones. He enlisted 8 April 1863 at Carthage and was described as 19 years old, 6' tall, blue eyes, dark hair and a fair complexion. John Smith signed the enlistment papers as his Guardian. During his service, he was absent without leave on 14 September 1863 and under arrest in November and December 1863. On 17 June 1868, the charges of absent without leave were removed from his record. He was on duty at Carthage and Liberty from 27 September to 1 November 1863. Jonathan was never married nor had any children. His mother, Nancy, applied for and received a pension from the Federal Government in 1890. Jonathan is buried in the Jones Cemetery in DeKalb County [The Jones Cemetery is located in an extremely rural area of DeKalb County. A tiny bridge, leading to the cemetery, is blocked with a chain and "No Trespassing" sign]. The Federal Government supplied a military headstone on 25 March 1884. LEE, James K. P. - Company L - James K. P. Lee was born about 1847 in Cannon County. He was the son of Ausburn/Osborne and Mary H. (Stacy) Lee. He enlisted on 26 January 1863 in Murfreesboro and was described as 18 years old, 5' 8" tall, blue eyes, light hair, and a fair complexion. He was present throughout his service. He never married nor had any children. His father died 10 September 1867. His mother Mary applied for and received a pension in 1868. At the time of her application, she was living in the Poor House in Cannon County. She died 14 October 1897. It is unknown where James was buried. MCGEE, John - Company L - John McGee was born in 1847 in Smith County. He was the son of George and Jane Cytha (Coggin) McGee. He enlisted on 26 December 1863 at Nashville and was described as 18 years old, 5' 6" tall, brown eyes, brown hair, and a fair complexion. He had only been with the cavalry two months when he was killed. He never married nor had any children. He is buried in the Mount Holly Cemetery in DeKalb County [A search of the Mount Holly Cemetery did not show a tombstone for John McGee]. The Federal Government supplied a Military Headstone on 25 December 1884. OAKS, John F. - Company L - John F. Oaks, also known as Foster, was born in Wayne County, Kentucky. He was the son of William and Nancy (Marcum) Oaks. He married Lavinia Shores on 25 February 1857 in Putnam County. They had three children: Andrew Johnson, Sarah Tennessee, and Nancy Ann. He enlisted on 1 May 1863 in Carthage and was described as 27 years old, 5' 10" tall, hazel eyes, light hair and a fair complexion. He was present for duty throughout his service. He died of a gunshot wound. He is buried in the Hugh Wallace Cemetery in Putnam County (Tombstone). After his death, Lavinia had a very difficult time. She was granted a widow's pension in 1865. On 29 April 1870, James T. Exum, former Captain of Foster's company, and Robert S. Alcorn wrote the US Pension Board that Lavinia Oaks was unworthy of a Federal pension. She was accused of lewd behavior after giving birth to two illegitimate children: Josephine in 1868 and Amanda F. in 1870. Her pension was suspended on 20 July 1870. At the request of the Postmaster and various other individuals, her pension was re-instated by 16 March 1871. Again on 4 October 1872, the Federal Government suspended her pension, because she was about to give birth to another illegitimate child. The investigator wrote "Shown that she was notoriously a common prostitute even up to about a year previous when she removed to Allen County, KY."
In December 1872, she moved to Scottsville, Allen County, Kentucky with all her children. She was living on the property of Andrew Anderson. He reported to the Pension board that she was a good mother and that he had never seen anything immoral about her. Her pension was restored. Lavinia died 14 September 1904. PISTOLE, Thomas J. - Company K - Thomas J. Pistole was born about 1844 in DeKalb County. He was the son of James and Nancy (Dean) Pistole. He enlisted on 6 August 1863 at Carthage and was described as 20 years old, 6' tall, black eyes, light hair and a fair complexion. His younger brother, Joseph, also served in the same unit. He never married nor had any children. His father died 8 July 1873. In 1880, his mother, Nancy, applied for but did not receive a pension based on his service. It is unknown where he is buried. PUCKETT, Perry - Company I - Perry Puckett was born in 1846 in DeKalb County. He was the son of Henry Lyde and Margaret (Love) Puckett. He enlisted on 13 July 1863 in Carthage and was described as 18 years old, 5' 6" tall, blue eyes, light hair, and a fair complexion. He was present for duty throughout his service. He never married nor had any children. It is unknown where Perry is buried. His brother, Sylvanus Puckett, was a 1st Lieutenant with Company I of the 5th Tennessee Cavalry. RICHARDSON, John G. - Company I - John Goslin Richardson was born about 1833 in Smith County to William and Sarah (Goslin) Richardson. He enlisted on 24 November 1862 in Nashville and was described as 29 years old, 6' tall, blue eyes, dark hair and a fair complexion. He was present throughout his service. He was appointed Corporal on 31 July 1863 and Sergeant on 24 November 1863. He never married nor had any children. It is unknown where he is buried. RICHARDSON, Riley M. - Company I - Riley M. Richardson was born about 1838 in Jackson County. He was the son of Barnett and Arena Richardson. He married Arminta M. Elmore on 28 January 1858 in Putnam County. Riley enlisted on 24 November 1862 in Nashville and was described as 26 years old, 6' tall, dark hair, brown eyes, and a dark complexion. He deserted from the forage train near Murfreesboro with a government issued pistol on 30 January 1863. He later returned to duty and was promoted to Sergeant on 22 February 1863. On 1 January 1864, Riley re-enlisted with the 1st Tennessee Mounted Infantry - Company B. He deserted and was arrested on 10 February 1864. He was then returned by Captain Exum to the 5th Tennessee Cavalry to finish his service. He died of a gunshot wound. It is unknown where he is buried. At the time of his death, Arminta was three months pregnant with their first child. She gave birth to a son, Washington R. "Mackie" Richardson, on 21 August 1864. In 1865, Arminta applied for and received a widow's pension from the Federal Government based on Riley's service. Her pension checks stopped when she married Hiser Valentine Richardson (a brother to John G. Richardson) on 22 August 1866 in Putnam County. On 18 October 1875, she applied for and received pension benefits for her son Washington Richardson. Riley's brother-in-law, Lindsey P. Vickers was also killed at the Battle of Dug Hill. STANLEY, Alexander - Company K - Alexander Stanley was born about 1842 in Cannon County. He was the son of John A. and Evaline (Higgins) Stanley. He enlisted on 26 July 1863 in Carthage and was described as 19 years old, 5' 6" tall, blue eyes, sandy hair and a fair complexion. He was present for duty throughout his service. He neither married nor had any children. It is unknown where he is buried. His older brother, Anthony Stanley, also served in the same unit. VANDERGRIFF, Adam D. - Company I - Adam Daniel Vandergriff was born about 1840 in Cannon County. He was the son of Allen and Mary Keeton (Davis) Vandergriff. He enlisted on 29 November 1862 at Nashville and was described as 21 years old, 5' 6" tall, blue eyes, dark hair, and a fair complexion. He deserted from the battlefield at Stones River on 31 December 1862 and returned to his unit on 6 June 1863. He was present for duty in July and August 1863 and absent without leave in September and October 1863. He was under arrest during November and December 1863. He neither married nor had any children. He is buried in the Salem Baptist Church Cemetery in DeKalb County. VICKERS, Lindsey P. - Company I - Lindsey P. Vickers was born 22 March 1818 in White County to Harden Elijah and Nancy Ann Morrow (Thomas) Vickers. He married Elizabeth Richardson on 25 October 1845 in DeKalb County. They had seven children: Mary Angeline, Esarilla, John H., Eliza, Harden Perry, Sarah Caroline, and Linsey Angeline. He enlisted on 24 November 1864 in Nashville and was described as 44 years old, 5' 10" tall, dark hair, blue eyes, and a fair complexion. Beginning on 18 March 1863, he was absent from his command while he was sick in the hospital. He returned to duty by June. He was captured in Dixon Springs on 22 June 1863 and paroled at City Point, Virginia on 8 July 1863. He reported to Camp Chase, Ohio on 17 July 1863. He was sent back to his regiment between 20-31 October 1864. He is buried in the Vickers Cemetery in Putnam County (Tombstone). In 1868, his widow, Elizabeth, applied for and received a US Pension. She remained unmarried until her death on 31 March 1898. Lindsey died with his brother-in-law, Riley M. Richardson at the Battle of Dug Hill. COUNTISS, William J. - Company G - William J. Countiss was born about 1848 in Wilson County. His parents were Asa and Margaret (Martin) Countiss. Several family members, including his father, served with the Confederate Army. William enlisted on 29 August 1863 in Alexandria and was described as 18 years old, 5' 8" tall, light hair, blue eyes and a fair complexion. He was not married nor had any children. It is unknown where he is buried. THURMAN, Patrick - Company G - Patrick was born about 1845 in Rhea County. He was the son of Hillard and Eliza Ann (Martin) Thurman. He enlisted on 22 October 1863 in Bridgeport, Alabama and was described as 18 years old, 5' 7" tall, blue eyes, auburn hair, and a fair complexion. He never married nor had any children. While on picket duty near Sparta, he was shot in the head but lingered until midnight before succumbing to his wounds. In 1879, his father Hillard applied for but did not receive a pension from the Federal Government. It is not known where he is buried. WILCHER, Thomas - Companies C & G - Thomas Wilcher was born about 1843 in Cannon County. His parents were William H. and Nancy J. (Close) Wilcher. In 1850 and 1860, he is living with his grandmother, Hannah Preston Wilcher, and her second husband, Vach Crabtree. He enlisted on 19 August 1862 in Nashville and was described as 21 years old, 5' 8" tall, blue eyes, brown hair, and a dark complexion. He was transferred to Company G on 14 November 1862. About 2 March 1863, he was on detached service in Carthage. In May and June 1863, he was absent with sickness. With those two exceptions, he was present for duty. Thomas never married nor had children. It is unknown where he is buried. Thomas and Elijah Crabtree were related by marriage: Thomas' grandmother, Hannah Preston Wilcher, married Elijah Crabtree's father, Vach Crabtree. They were both on Picket Duty and killed the same day. BASS, Ezekiel W. - Captain of Company K - Ezekiel W. Bass was born 28 April 1823 in Wilson County. He was the son of Archamack M. and Rachel (Phillips) Bass. He married Susannah A. Lawrence about 1846 in DeKalb County. They had ten children. He enlisted 25 February 1863 in Murfreesboro and was 39 years old. He enlisted as 2nd Lieutenant in Company I and was promoted to Captain of Company K on 6 August 1863. His son, John A. Bass, enlisted in Company K on 26 July 1863 in Carthage. On 18 June 1864 while stationed in Tullahoma, Bass formally requested leave from his command to go to his home in DeKalb County to visit his family. When this request was denied, he deserted his command and took about 75 men with him. He was arrested at his home on 23 June 1864 after Lt. Colonel William J. Clift issued orders for his arrest. He was restored to duty by Special Order 80 by Major General Milroy. Bass was formally dismissed from US Service on 4 December 1864 when he faced a Court Martial for his desertion and arrest in June 1864. During his court martial, he was found 1) Guilty of Deserting his command, 2) Not Guilty of Aiding and abetting desertion, 3) Guilty of Positive and Willful Disobedience of Orders, 4) Guilty of Desertion, and 5) Not Guilty of Theft (he was accused of stealing and selling for his own personal gain a pistol in the possession of Lt. Thomas A. Beaton's servant on 23 October 1863). After the war, Ezekiel returned to his family and home in DeKalb County. His wife, Susie, died 10 August 1895. Ezekiel then married Sarah A. Hollingsworth on 17 September 1896 in DeKalb County. Ezekiel died 21 October 1900 and was buried in Salem Baptist Church Cemetery in DeKalb County. (See FindAGrave). Ezekiel applied for and received a US Pension in 1886. After his death, his widow Sarah applied for and received a Widow's pension. CLARK, John W. - Company K, 1st Tennessee Mounted Infantry - John W. Clark was born 4 July 1830 in Sullivan County. He enlisted in the 1st Tennessee Mounted Infantry on 10 December 1863 at Carthage. It is unknown why he was riding with the 5th Tennessee Cavalry in February 1864, but he was with the Advance Guard and was the company Bugler. He was promoted from Private to Musician on 12 March 1864. He was discharged on 14 April 1865. 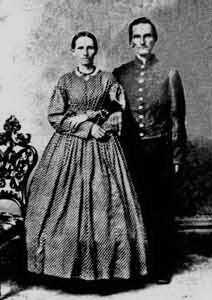 After the war, he married Mariah L. Holt on 14 November 1869 in Lyon County, Kentucky. They had six children. John died on 7 April 1916 and is buried in the Meadows Cemetery in Caldwell County, Kentucky (See FindAGrave). John applied for and received a US Pension. After his death, his wife applied for and received a Widow's Pension. In 1911, John published a personal account of the Battle of Dug Hill which appeared in numerous papers across the country. The title of his article was Lively Scrap in Tennessee - Interesting Account of "Calf Killer or Dug Hill" Battle - Twenty Out of 72 Get Away. GANN, Russell - Company I - Russell Gann was born in January 1829 in Cannon County. He was the son of John and Permelia Gann. He enlisted on 29 November 1862 in Nashville and was described as 25 years old, 5' 6" tall, blue eyes, dark hair and a fair complexion. He was captured near Hartsville on 18 April 1863 and returned to his unit shortly thereafter. He was present for duty throughout his service except for a brief time beginning 30 August 1864 when he was absent without leave. He was discharged on 14 August 1865. He married Margaret Elizabeth McPhearson on 29 July 1859 in Cannon County. They had three children. In 1884, Russell applied for and received a pension from the US Government. He died after 1900 in DeKalb County. It is unknown where he is buried. JENNINGS, Wesley - Company G - Wesley Clay Jennings was born 7 October 1844 in Wilson County. He was the son of Jacob and Nancy Ann (Robinson) Jennings. He enlisted on 25 February 1863 in Murfreesboro and was described as 18 years old, 5' 5" tall, blue eyes, brown hair, and a fair complexion. He was present for all duty until he was discharged on 14 August 1865. During the fight at Dug Hill, he lost a horse, horse equipment, one carbine (Merrill's Patent), a sling, one pistol (Colt's Patent), 1 pistol belt & holster, one sabre and sabre belt. After the war, he married Mary Ann Coble on 24 October 1867 in Wilson County. They had four children. Wesley died on 28 August 1912 and is buried in the Prosperity Cemetery in Wilson County (See FindAGrave). He applied for and received a US Pension in 1890, and his widow applied for and received a Widow's Pension after his death. LEMONS, Joseph B. - Company K - Joseph B. Lemmons was born on 20 October 1841 in Cannon County. He was the son of Ada and Elizabeth (Nivens) Lemons. He enlisted on 3 April 1863 at Carthage and was described as 23 years old, blue eyes, light hair and a fair complexion. His service records indicate that he was captured at Decatur between 1 May - 15 June 1863 and paroled at City Point, Virginia on 7 July 1863 and Lookout Point, Maryland on 11 July 1863. The remaining time, he was present for duty. During the Battle of Dug Hill, he lost his horse and horse equipment. He was discharged 14 August 1865. He married Matilda Emeline Duke on 22 March 1877 in Cannon County. They had four children. In 1890, he applied for and received a US Pension. He died on 22 August 1904 in Cannon County and is buried in the Beechgrove Cemetery (See FindAGrave). After his death, his widow Matilda applied for and received a Widow's Pension. LEWIS, William R. - Company K - William R. Lewis [PHOTO] was born 5 June 1834 in DeKalb County. He was the son of William Carroll and Hannah Lee Anne (Adams) Lewis. He married Elizabeth Moore on 17 January 1858 in Wilson County, and they had ten children. He enlisted on 22 February 1863 at Murfreesboro and was described as 27 years old, 5' 6" tall, dark eyes, light hair, and a fair complexion. He achieved the rank of Commissary Sergeant. He was present for duty throughout his service. At the Battle of Dug Hill, he lost a sabre, belt, and cartridge box. He was discharged on 14 August 1865. He applied for and received a US Pension in 1897. He died 4 August 1914 and is buried in the Prosperity Cemetery in Wilson County (See FindAGrave). After his death, his widow, Elizabeth, applied for and received a Widow's Pension. MAHAN, James - Company C - James Mahan was born about 1843 in Jackson County. He was the son of James A. and Nancy (Harris) Mahan. He enlisted on 18 August 1862 in Nashville and was described as 19 years old, 5' 7" tall, grey eyes, brown hair and a dark complexion. He was present with his unit until 22 June 1863 where he was captured by the enemy in Hartsville. He was paroled on 8 July 1863 at City Point, Virginia. He was transferred to a station in Camp Chase, Ohio on 17 July 1863 where he remained for several months. He returned to his regiment between 21-31 October 1863. After the Battle of Dug Hill, he was present for duty until 10 February 1865. At this point, he was transferred to Tullahoma where he served as an Orderly at the Headquarters located there. He was discharge 25 June 1865. About 1870, he married Hicksie Kirkland in Allen County, Kentucky. After their marriage, they moved to Todd County, Kentucky. James died in the insane asylum in 1874 in Elkton, Todd County, Kentucky. It is unknown where he is buried. He and Hicksie had one daughter named Mary E. V. Mahan. She married Joseph Stout. In 1909, Mary V. E. Stout applied for a Minor's pension based on James' service. The application was denied. MEARS, Thomas J. - Company K - Thomas Jonathan Mears [Photo] was on born 15 December 1832 in Warren County. He was the son of William F. and Frances Elizabeth (Young) Mears. He married Elizabeth Alexander on 30 December 1854 in Cannon County. They had twelve children. He enlisted on 23 March 1863 and was described as 30 years old, 5' 9" tall, black eyes, black hair, and a dark complexion. He was present for all duty except for 17 October 1864 and 20 May 1865 when he was absent without leave. During the Battle of Dug Hill, he lost his horse and horse equipment, his carbine (Merrill's patent), his sabre, and his sling. He was discharged on 14 August 1865. In 1889, he applied for and received a US Pension. He died on 8 June 1922 and is buried in the Curlee Cemetery (See FindAGrave) in Cannon County. OVERALL, James H. - Company H - James H. Overall was born on 21 February 1843 in DeKalb County. He was the son of Wesley and Orena (White) Overall. He enlisted on 22 June 1863 at Carthage and was described as 21 years old, 5' 6" tall, blue eyes, light hair, and a fair complexion. He was present throughout his service except for 27 December 1864 when he was absent without leave. He was promoted to Sergeant on 23 March 1864 and reduced to Corporal the next month. He was again promoted to Sergeant on 1 October 1864. During the Battle of Dug Hill, he lost his horse, horse equipment, and his blanket. He mustered out 14 August 1865. He married Louisa Callie Turner on 16 February in 1870 in DeKalb County. They had seven children. In 1890, he applied for and received a US Pension. He died on 10 July 1912 and is buried in the Salem Baptist Church Cemetery (See FindAGrave)in DeKalb County. After his death, his widow Callie applied for and received a Widow's Pension. STONE, Enoch H. (PHOTO) - Company I - Enoch Herschel Stone was born 9 January 1828 in Jackson County. He was the son of Thomas and Elizabeth (Williams) Stone. He married Eliza Maxwell about 1848 in Jackson County, and they had nine children. He enlisted 22 July 1862 in Nashville and was described as 34 years old, 5' 4" tall, grey eyes, brown hair and a fair complexion. Two brothers also served in the union army. Isaac C. Stone enlisted in Company L, and Elihue P. Stone enlisted in Company G of the 53rd Indiana Infantry. Enoch was promoted to Corporal on 9 September 1862. When Ezekiel W. Bass was promoted to Captain, Enoch took his place as 2nd Lieutenant and was commissioned on 6 August 1863. In the Battle of Dug Hill, he lost his horse and two colt pistols. On 8 August 1864, he submitted his resignation letter citing his recent election to the office of County Court Clerk in Putnam County as his reason for resigning. He returned to Putnam County where he served as County Court Clerk until after 1870. His wife, Eliza, died on 2 October 1871 near Steelville, Missouri. He then married Minerva Jane Patton on 30 June 30 1872 in Putnam County, and they had two children. She died 5 August 1901 in White County. Enoch married his third wife, Susan Pistole (widow of Thomas J. Pistole), on 3 March 1903 in White County. He died 16 November 1909 in White County and was buried in the Jericho Cemetery (See FindAGrave). He applied for and received a US Pension in 1890. After his death, his widow Susan applied for but did not receive a widow's pension.